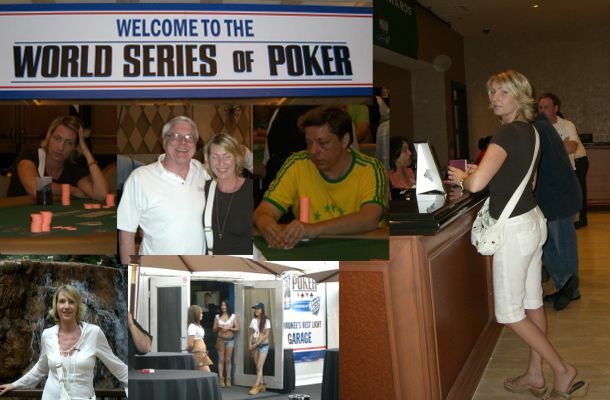 Wow, action at the WSOP has started big time already! But step-by-step through the last day, otherwise I have no chance to follow what has happened when, things already start to blur vegas-style, it’s all poker, cards, money, people, no days, nights, left, right, everything gets relative here. It’s even hard to tell the day of the week and we have to calculate using WSOP events as markers already ("first event for Katja is #2, which happens on Tuesday so must be Monday today"). Let me try to remember how the last 24 hours went: after I posted the last update to this blog we went over to the Mirage poker room, I was stuck from the time-period before (I reject to say "night" or "day" here) so hungry to recup. They were just opening a brand new 20/40 game and I recognized 4 locals which I have seen playing there over the course of the last years and 2-3 tourists, one of them I spotted right away as a very dangerous young internet player. While I played Katja went to do some shopping. I had a good start in the game, being up about 900 in the first hour. When Katja came back the played a $70 sng to start get into the action. After running into KK in the BB in the late stages she busted in 4th place. Meanwhile I had some up’s and down’s and when Katja told me she would go back to the room I decided to go with her and quit a $700 winning session. Back in the room it was about 3:30 PM and we decided to go to the Rio’s at about 6. So we relexed and sleept for about two hours and then took a taxi to the Rio’s. Arriving there exitment grew as we registered ourselves (some kind of waiting line already!). Then, going into the Amazon ballroom for the first time this year I almost feel out of my shoes: the room was full already, humming and buzzing! At least 40 cash games tables were going, som kind of "Tournament of champions" was held (I saw Daniel Negrenau and Chris Fergusen thru the last viewing crowd) and about 30-40 satelllite tables were going! We had some time left until our scheduled meeting with the Pokerstars stuff so we decided to play a satellite. Standing in line we met long time buddy Ron Rose who in turn talked me into playing a $325 satellite instead of the planned $175… only fair as I busted him a little later 😉 Katja entered the $175 and got a very nice 2nd place, winning one $500 buyin-chip after they decided on a saver being heads-up when she had the slight lead. In my satellite I got an early present when I found ten’s in the small blind with 3 limpers. I made it 300 to go, getting one caller. Hmmm. The flop was a harmless 834 rainbow I made a 500 bet – he called in a split-second! Hmmm Hmmm. The turn was a beautyfull ten, giving me a set. I throwed my last chips into the pot (about 300 only) and again he called without any hesitation. I showed my set and expected to see slowplayed AA but the called me for all his chips in this spot with AJo !!! Unbelivable. Anyway, I used those chips to get me into the chip lead when only 3 players were left (busting Ron with AQs vs JJ on the way). 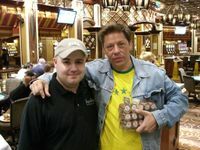 Then I missed a hand and got down to average chips – when the smallest stack doubled up also we were dead even in chips I suggested to just split the price money ($3000 in buyin chips and $120 in cash). Both agreed and so I won some buyin chips also, Katja’s and my result combined gave us 3 lammers for $500 each from a $500 cash investement, +$1000, very nice. We called the Pokerstars people but they were stuck at the Mirage so we suggested that we go over there to make things easier. We grabbed a cab and only 10 minutes later I was again sitting in that 20/40 game. 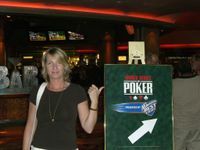 We took a break when Pokerstars Sharon Goldman, Vice President of Marketing Dan Goldman and Director of Communications Nolan Dalla appeared and had a brief meeting with them about some details in the endorsement deal. Everything went as perfect as possible, these pokerstars guys are realy pro’s and have their homework done. A real pleasure to deal with them (not like some others we have dealt with in the recent past…). After they left we went to the new "Stacked" steak house at the Mirage (don’t go, poor foot by vegas standards). Leaving there at about 11 PM Katja went back to the room and I took my seat back in the 20/40 game. First I got ahead about $500 in that game and was already about to leave when some guy started to beat me in every hand. It was really ridicioulous. He cracked my aces with AJo, my straights with backdoor flushes, my flopped seats with runner runner better boats and so on and on and on. When another super-wild aggressive player joined the game I was already stuck about 1k and this only got worse up to the point where I was $1700 behind, still playing "normal" and patient. Being stuck and a little frustrated I decided to fight fire with fire and announced to the table that they should fasten seat bealts now as my online nickname is "50outs" and I would start to play back now (raised eyebrowes from the indeed good and dangerous internet player). And playing back I did! From that point on the game was really on, every street in every pot was capped (and called 3-5 ways) and it was fun to play. I gave my fair share of beatings, took several new ones but overall it was at least fun now. When the game broke beause 2 players run out of money it was 3 AM, I recovered to -$900. Still very awake I decided to play on, went over to the Bellagio, chatting with a good other player from that game on the way. two hours (Katja just came back from a massage), watched the game Italy vs. Australia a little bit and now we are thinking about breakfast, shopping and – getting back in action!! !